The holidays are over so it’s time for ‘out with the old and in with the new.’ However, disposing of some household items is not as easy as throwing away in the trash due to space or guidelines. Bin There Dump That OKC can help you get rid of these items quickly. Nothing changes as quickly as technology nowadays! Almost every year, a new model cell phone, game system, or tablet are introduced. There are also technology advances with televisions, making them bigger, more clear, or more accessible for applications. Because of this and great store sales, electronics make for some of the best gifts. However, getting rid of the old models isn’t the easiest with strict guidelines for e-waste with most city utility companies. Bin There Dump That OKC takes all electronics, giving you an easy plan to get rid of the old items. Another sale opportunity at this time of year is for bedding, such as mattresses. 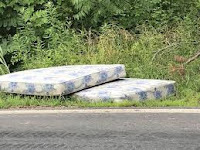 Old mattresses are one of the most difficult items to get rid of, because not only do they not fit in the trash can, but many disposal companies do not take them. But we do! BinThere Dump That OKC has great bin sizes that accommodate mattresses. And if your box spring is being replaced, throw that in also! Our bins will have space for both and even the old pillows! 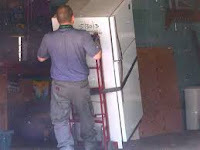 From small to large kitchen appliances, Bin There Dump That OKC will accept all that are needing to be discarded. This even includes refrigerators! Being one of the very few companies that accepts refrigerators, however, we need to be sure it is done correctly. So, just be sure to mention when ordering because of certain requirements and Bin There Dump That OKC can haul it away. 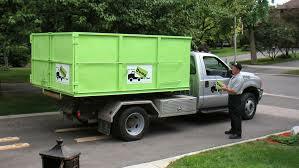 Whether it is appliances, e-waste, or bulky mattresses, Bin There Dump That OKC can help you quickly clear out the old so you can fully enjoy the new! Call us today and book your bin. With 5 different sizes, there is a perfect size for your job. And to make the job even easier, if you order in the morning, we can get it to you in the same day! All rentals include 10 days to complete the job, so you can take full advantage of having a roll-off dumpster at your disposal.